Claire Riordan (she/her/hers) identifies as a white, queer woman and grew up here in Portland, Oregon. She was born with albinism and is legally blind, so loves both Oregon’s overcast rainy weather and large print books. Claire was the 2015-2016 VISTA Leader at Campus Compact of Oregon and later became our Communications and Development Manager. In this role, Claire works to communicate our racial justice mission to a wide and varied audience. She is also a qualified administrator of the Intercultural Development Inventory (IDI). She has a BA in Political Theory from Whitman College, where she studied liberalism and its limitations, especially when it comes to education the liberation and self-determination of historically marginalized groups. 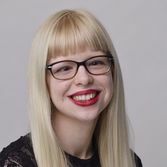 Claire is interested in having conversations about how systems impact our individual experiences, examining access and ability with an intersectional approach, and will probably make a lot of obscure Harry Potter references if you get to know her well. In her own growth process, Claire is working to understand what it means to decenter whiteness and embrace multidimensionality, unlearn her own ableism, and cultivate authenticity in relationships across difference.